Building on the vision of Kevin Lynch, who formulated the legible city concept in The Image of The City (Harvard/MIT, 1960), the methodology of city wayfinding has made great strides in the past two decades since Mike Rawlinson, then a town planner in Bristol, conceived the Bristol Legible City project. Rawlinson engaged a number of design firms, including PSD and MetaDesign, to help develop the project; the resulting scheme is widely held up as an example of how pedestrian wayfinding can improve the image and usability of a city centre. Bristol set standards and provided a modern template for some essential components of legible city schemes, such as a range of sign types, the quality of map design needed to make the system work, the importance of consistent place naming, and an understandable rationale for sign placement. The success of Bristol can be measured in its longevity and its continuing popularity with local businesses and the city council. Performance statistics are thin on the ground, however, since no before and after evaluation had taken place. Nevertheless the project sparked interest among city governments and transit authorities in the UK and worldwide, looking to optimise their infrastructure capacity, enhance the appeal of their offer, and meet the challenges of anticipated growth combined with increasingly onerous sustainability constraints over the coming decades. When London was tackled ten years later, some of the lessons of Bristol were addressed. The sheer scale and complexity of this project, combined with its high profile, presented new challenges, opportunities and risks. If completed, Legible London represented a significant investment by the city and the benefits had to be demonstrated. 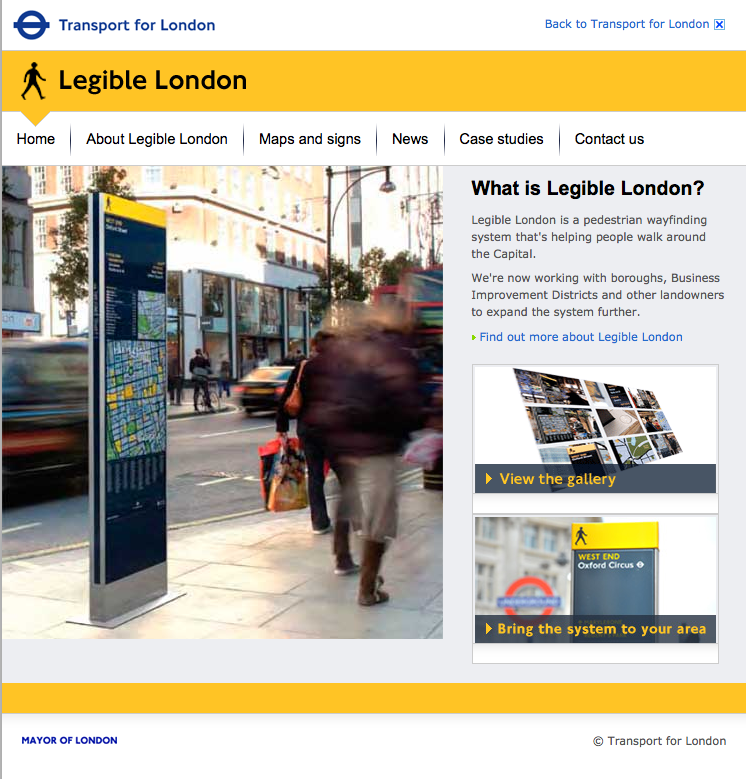 I wrote the Legible London wayfinding study that led to the development of the scheme. It was commissioned by Central London Partnership (CLP), a body whose membership included the seven boroughs of Central London as well as private sector stakeholders, using a grant from Transport for London. CLP’s chief executive, Pat Brown, was impressed with the Bristol project and felt a similar approach could work in central London. Her vision was that the city as well as its users would benefit from a system that gave people “the confidence to get lost”, safe in the knowledge that they were never too far from the wayfinding system. The study, based on research by AIG London and Lacock Gullam who jointly developed the subsequent system design, with further research by LSE Cities, had shown that one in five underground train journeys in central London covered less than 800 metres, an easily walkable distance. The reasons many went by train were a lack of confidence that they could find the way, little grasp of the distance, but great confidence in the easy-to-use London tube map (which distorts the geographical sense of direction and distance). If local business on the one side accepted that by making the city more attractive to visitors, coordinated wayfinding would benefit the economy, on the other side the transport authority, Transport for London, had a significant interest in relieving tube capacity in the central area by persuading people that their intended journey would be quicker and more pleasant on foot. Following acceptance in principle by the 33 boroughs, and with support from the Mayor and the London Development Agency, TfL commissioned detailed development of the concepts and studies of potential pilot areas. Over a period of two years the design development consulted and looked at all aspects of how the scheme would work. Making the system usable meant understanding the ‘total journey’ of different users, striders and strollers, moving across different areas and using multiple modes for journey stages. 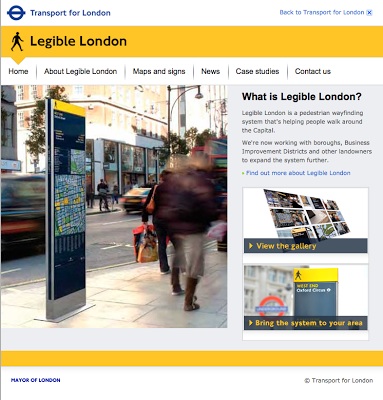 Legible London sought to be multi-modal by ensuring coordination of its information with other transport modes such as tube, car, bus and the new cycle docking stations and cycle super highways; multi-media by providing connected information in street signs, print and online (though the latter was not achieved in London at that time); inclusive by providing an optimally balanced design for the broadest range of user groups in testing and consultation with accessibility experts and user groups; and ubiquitous by opening the information up for use by owners of connected systems and channels, such as private developments and material produced by hotels and visitor attractions. The key content elements were Mapping, Naming, (Typo)graphics and Placement. The design team conducted weekly user testing using a mock sign with the latest design iteration which was taken to Regent Street every week to see how people used it, what questions they needed answering, what worked and what did not. As a result of this process, the original design for the ‘overview’ or ‘planner’ map was radically changed as the original “map of villages” was found not to be useful. The information typeface was also tested and this led to replacing the original font with New Johnston which, through its longstanding association with London transport information, was found to be subliminally trusted. The user testing process also led to the addition of an alphabetical index below the finder map. Legible London has two significant lessons in the area of mapping besides those referred to above. The first relates to the source data used and may be specific to the UK, in that the source used for most public service mapping traditionally has been the Ordnance Survey. The publishing restrictions of OS mapping, however, present serious concerns for its use in consumer-facing schemes of this kind, including a licensing policy that requires royalties for every print and every click to be paid, and restrictions on the amount of detail that is permitted to be shown online. Ordnance Survey was used as the base map for the prototype and again (against the advice of the design team) for the pilots. It was only after this that TfL commissioned a “royalty-free” base map for the further roll-out of the scheme. After the Legible London Prototype we explored other base map options and used ortho-rectified aerial photography from Infoterra, supplemented with field surveys, as the source for the city maps in Brighton, Leeds, Sunderland and Ipswich - all matching the quality of the OS MasterMap-based maps produced for London, and without the same barriers to ubiquity. The general point is that it is important to be satisfied that source data used for mapping not only has the required quality, integrity and currency, but it can also be procured without obstacles to its subsequent use to optimise the benefit for the city. The second mapping lesson concerns maintenance and production. There is now a growing number of options for ensuring that a master map is kept up to date and capable of delivering all required outputs cost effectively. The management of this information (and the manageability of the system provided) is as important to the future quality of the scheme as the physical updating and maintenance of the street signs. These arrangements must be fully understood and thought through for a scheme to succeed. Effective wayfinding requires that places are named and defined consistently, particularly in complex city environments. This can be politically sensitive, with strong opinions held by developers, resident groups and their elected representatives. In London, there is a rich historical fabric of names that are rooted in the public consciousness. It is a city of villages, many of which historically are actually towns and cities themselves. In the Legible London development process, consultations with stakeholder groups ensured that the names and delineations chosen had public acceptance - or at least, that the key groups felt they had been heard in the process. Sign placement is the key planning issue that must be got right for users to understand the scheme. If a system is to be rolled out in phases, it is beneficial to produce the placement plan for the whole scheme at the outset to avoid disconnections arising within the system. A number of the ‘controversies’ that had caused heated discussion during the years of development abated when the first signs went in the ground. Now the test was no longer “the opinion of designers”, but “the experience of users”. The idea that heads up mapping works better in fixed street signs was not seriously challenged after this. Similarly there had been great anxiety in different, distinctive parts of London that a uniform system design might undermine local character - ie should signs in Oxford Street look the same as those on a river towpath in rural Richmond-on-Thames? The quality and efficacy of the product also won out in this respect. While the product range, or ‘kit of parts’ must be sufficiently flexible to meet the needs in different environments, all items are part of the same range. Other questions about character and brand also faded. While the scheme as a whole can be designed for the city, its essential purpose is delivering information in the most effective and coordinated way. The information is the brand, both for the scheme as a whole and for the areas in which it is implemented. Consider trends in the relationship between mobile information and physical infrastructure, including eg: realtime information, services and transactions; special needs user experience; languages.